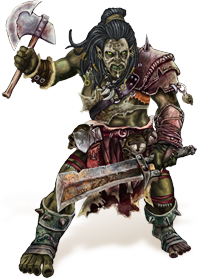 Fierce, strong and brave in numbers, Orcs excel in waging an aggressive playstyle by using their grit, toughness and non-nonsense approach to warfare. If worked correctly, they can also have some of the best-defended cities in the land. t the start of everything was the First Tribe. It ruled everything, made everything, owned everything. The Great Chief had a horde of Always-Chiefs, who commanded everything valuable, everything important. They always would. There was an Always-chief for the Hunt. An Always-Chief for birth. An Always-Chief for death. An Always-Chief for Fire. There were lots of Always-Chiefs – more than you could count. In the Tribe, there was fighting. Then there was feasting. Then there was more fighting. It went on for years. The Great Chief rewarded the winners. The winners made slaves of the losers. In the end, there were only four Champions. They had made slaves of everyone. The Great Chief saluted them. He turned to the greatest Champion, and said to him, "Greatest Champion, undefeated hero, who we all hail with the name Orc. You have defeated more than anyone else. What prize shall I give you?" Orc said: "I fight for you. I fight for my chieftains. I fight for Great Chief and the Always-Chiefs. I want no reward, but to shed blood for my chieftain!" The Great Chief laughed. He laughed so that trees fell and the animals fled. He laughed bigger than any storm. He said, "That is the best answer! So, maybe I do this. Maybe I free the slaves, and you all fight again. What would you do then?" Orc pointed at the second Champion. "I fight the most dangerous foe! First, I challenge this champion, called Man. And I make him my slave. Then everyone knows I am mightiest!" The Great-Chief said "This is good! You, Man! What do you say!" But Man said "No! I will not give up my slaves!" Man refused. Man would not obey his Great Chief. They argued. They shouted. But man would not obey. "I will fight you!" screamed Orc. "I will chase you down. I will hunt you like a pig. I will kill you, skin you, eat your guts. From your skull I will drink your blood!" At this, all the Always-Chiefs roared and cheered. They all knew Orc was greatest of Champions, and most loyal. But Man went to gather his followers. He would not fight Orc alone, and so their followers clashed and fought for years. Orc had the best fighters. So the tribe of Man tamed horses so they could run away. Then the tribe of Man built castles to hide in. Then Orc said "Where are the other Champions? We should all fight traitor Man. We should kill his tribe. We should peel off their skins, make cloaks from them to give as gifts to the Always-Chiefs. We should build a new throne for Great Chief, using their bones!" But the Always-Chiefs said "The other Champions have run away." So Orc cried "Then tell me where they are! I will kill them all. I will make more cloaks for you, and a bigger throne for Great Chief!" They said "The third Champion, Dwarf, is slow and dull, he is strong but with no taste for blood. So, Dwarf has hidden. He digs into the mountain, and guards his holes with huge walls." "And where is the weakest?" Orc asked. "Elf is hiding in the forests. He thinks you can't find him there. He fears your strength, he plots against you." "All will die!" said Orc. "No," said the Always-Chiefs. "You asked to fight. That was the reward you wanted. You said you would make slaves. This is your fight. Great-Chief has given you the whole world to fight over. Tribes of Man and Dwarf and Elf are all there for you. Fight them. Conquer them. It's stupid to kill those you can own. Make them slaves." "Then I will fight everyone," said Orc. "I will make slaves of all tribes!" "It is what you are in the world for," said the Always-Chiefs. "You are loyal. If you seek aid, your priests can ask us, and we will bless you. But you are also strong. So, this world is yours. Conquer it!" So, that was the First Age. There was fighting. Then there was feasting. Then there was more fighting. It went on for years.